Stone Health Innovations, a Connecticut-based patient health management services and technology company, has helped an early-adopter physician to realize positive results in the new CMS Chronic Care Management Program. The results offer a first glimpse of the power held for both patients and providers within the new CCM program. 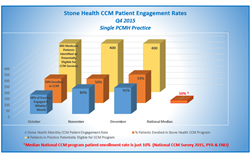 Stone Health Innovations, a patient health management company, has helped an early-adopter physician practice to realize positive results in the new CMS Chronic Care Management Program. The Connecticut-based company creates provider and patient-centric chronic care management (CCM) and transitions of care management (TOC) services and technology solutions. Stone Health was a first- to- market company for the new program, having implemented one of its initial CCM programs early in May 2015. Lanesey has over 20 year’s healthcare experience. Her partner, Raymond “Scott” Stone, has 13 years’ experience in the technology and finance sectors. They developed Stone Health Innovations to fill a need they recognized in the market space for flexible, meaningful and effective care management tools that reduce the workload on providers. Stone Health works as an extension of a provider’s practice assisting them in the care of their patients. The Stone Health report of CCM program results are the product of analyses done on the data collected within their information technology platform, IdeaCare, a system developed with well- defined discrete, searchable, data fields created to allow for effective and efficient population health reporting. The results reflect the CCM program over the course of an 8 month period in a bilingual, diverse 400 patient Medicare population- the initial CCM program they implemented in May, 2015 at the infancy of the CMS CCM program. Lanesey equates the positive results to the simplicity of use of the Stone Health IdeaCare system for the end user, the engaging IdeaCare patient care screens, a highly skilled and patient-empowering CCM navigator and a sand-box approach to collaboration with the PCMH provider. “The Stone Health IT platform is one of the most inter-operable in the industry,” says Lanesey. “It’s paired with a solid clinical foundation that includes numerous patient screens based on validated studies. These screens allow for proactive risk identification in the Medicare population that exceeds the opportunity for such found within claims data or text messages, a differentiator of Stone Health in the CCM competitor landscape. Personal telephonic and some face-to-face engagement with our patients had a great impact on our results. Although I support text messaging and tele-health engagement methods, it’s important to understand the population you are working with first to determine the potential effectiveness of patient engagement methods. The Stone Health IdeaCare system is built with the capacity to perform text messaging to patients, but reaching out to a Medicare population, many of which don’t own a cell phone or computer and many who are typically not technologically savvy, using a text-messaging engagement strategy was counterproductive to what we were trying to accomplish at Stone Health-true engagement of our Medicare patients. Lower monthly patient engagement rates not only point to less empowered patients, but less healthy revenue in practices that need revenue sustainability.The Stone Health team's experience with the Medicare population over the course of our 50 plus year career, convinces us that using text messaging in this population as a means of patient engagement is rarely effective. I am certain doing so would have significantly reduced our patient engagement rates and gaps in care fulfillment levels, undermining our goal of focusing on value over price. Stone Health is a patient and provider-centric company. The company has developed flexible staffing and pricing models to fit the variable needs of providers for truly engaging, efficient and profitable care programs. In addition to offering chronic care management, Stone Health offers transitions in care management and annual wellness visits. In first quarter, 2016, the company will roll out its diabetes management program focused on the early identification of patients at risk for diabetes and the management of those with the disease. This program will complement the Stone Health Innovations offerings and continued goal of creating Healthier Practices. Healthier patients.